Cinnamon is a free and open-source desktop environment for the X Window System that derives from GNOME 3 but follows traditional desktop metaphor conventions. Cinnamon is the principal desktop environment of the Linux Mint distribution and is available as an optional desktop for other Linux distributions and other Unix-like operating systems as well. The development of Cinnamon began as a reaction to the April 2011 release of GNOME 3 in which the conventional desktop metaphor of GNOME 2 was abandoned in favor of GNOME Shell. Following several attempts to extend GNOME 3 such that it would suit the Linux Mint design goals, the Mint developers forked several GNOME 3 components to build an independent desktop environment. 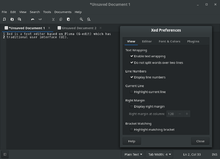 Separation from GNOME was completed in Cinnamon 2.0, which was released in October 2013. Applets and desklets are no longer compatible with GNOME 3. As the distinguishing factor of Linux Mint, Cinnamon has generally received favorable coverage by the press, in particular for its ease-of-use and gentle learning curve. With respect to its conservative design model, Cinnamon is similar to the XFCE and GNOME 2 (MATE and GNOME Flashback/Classic) desktop environments. Like several other desktop environments based on GNOME, including Canonical's Unity, Cinnamon was a product of dissatisfaction with GNOME team's abandonment of a traditional desktop experience in April 2011. Until then, GNOME (i.e. GNOME 2) had included the traditional desktop metaphor, but in GNOME 3 this was replaced with GNOME Shell, which lacked a taskbar-like panel and other basic features of a conventional desktop. The elimination of these elementary features was unacceptable to the developers of distributions such as Mint and Ubuntu, which are addressed to users who want interfaces that they would immediately be comfortable with. To overcome these differences, the Linux Mint team initially set out to develop extensions for the GNOME Shell to replace the abandoned features. The results of this effort were the "Mint GNOME Shell Extensions" (MGSE). Meanwhile, the MATE desktop environment had also been forked from GNOME 2. Linux Mint 12, released in November 2011, subsequently included both, thereby giving users a choice of either GNOME 3-with-MGSE or a traditional GNOME 2 desktop. However, even with MGSE, GNOME 3 was still largely missing the comforts of GNOME 2 and was not well received by the user community. At the time, some of the missing features could not be replaced by extensions, and it seemed that extensions would not be viable in the long run. Moreover, the GNOME developers were not amenable to the needs of the Mint developers. To give the Mint developers finer control over the development process, GNOME Shell was forked as "Project Cinnamon" in January 2012. Gradually, various core applications were adapted by the Mint developers. Beginning with version 1.2, released in January 2012, Cinnamon's window manager is Muffin, which was originally a fork of GNOME 3's Mutter. Similarly, since September 2012 (version 1.6 onwards), Cinnamon includes the Nemo file manager which was forked from Nautilus. Cinnamon-Control-Center, included since May 2013 (version 1.8 onwards), combines the functionality of GNOME-Control-Center with that of Cinnamon-Settings, and made it possible to manage and update applets, extensions, desklets and themes through the control-center. Gnome-Screensaver was also forked and is now called Cinnamon-Screensaver. Since October 2013 (version 2.0 onwards), Cinnamon is no longer a frontend on top of the GNOME desktop like Unity or GNOME Shell, but a discrete desktop environment in its own right. Although Cinnamon is still built on GNOME technologies and uses GTK+, it no longer requires GNOME itself to be installed. 2017-05-07 Linux Mint 18.2 Desktop grid, wildcard support in file searches, multi-process settings daemon, desktop actions in the panel launcher, separate processes for desktop handling and file manager in Nemo. 2018-10-04 Linux Mint 19.1 An additional desktop panel layout option that offers a more modern looking theme and grouped windows. Cinnamon introduces X-Apps which are based on GNOME Core Applications but are changed to work across Cinnamon, MATE and XFCE; they have the traditional user interface (UI). As of 24 January 2012[update] there was no official documentation for Cinnamon itself, although most documentation for GNOME Shell applies to Cinnamon. There is documentation for the Cinnamon edition of Linux Mint, with a chapter on the Cinnamon desktop. Cinnamon 3.0.7 Menu showing on Linux Mint 18 Sarah. Cinnamon 1.6 showing a Alt-Tab thumbnails and window previews. Cinnamon 1.6 showing a Notification Applet. Cinnamon 1.6 showing a Workspace OSD. New overview modes have been added to Cinnamon 1.4. These two modes are "Expo" and "Scale", which can be configured in Cinnamon Settings. Cinnamon can be modified by themes, applets and extensions. Themes can customize the look of aspects of Cinnamon, including but not limited to the menu, panel, calendar and run dialog. Applets are icons or texts that appear on the panel. Five applets are shipped by default, and developers are free to create their own. A tutorial for creating simple applets is available. Extensions can modify the functionalities of Cinnamon, such as providing a dock or altering the look of the Alt+Tab ↹ window switcher. Developers can upload their themes, applets and extension to Cinnamon's web page and let users download and rate. Cinnamon is available in the Linux Mint 12 repositories, and is included in all Linux Mint versions 13 and higher[needs update] as one of the four possible choices of desktop environment, one other being MATE. It is also an optional user interface in Linux Mint Debian Edition Update Pack 4 respin. Outside Linux Mint, Cinnamon is available for Ubuntu via a PPA, Fedora (as a spin), openSUSE, Arch Linux, Gentoo Linux, Mageia, OpenMandriva, Debian, Pardus, Manjaro Linux, Antergos, Sabayon 8 and FreeBSD. In their review of Linux Mint 17, Ars Technica described Cinnamon 2.2 as "being perhaps the most user-friendly and all-around useful desktop available on any platform." In their review of Linux Mint 18, ZDNet said: "You can turn the Linux Mint Cinnamon desktop into the desktop of your dreams." ^ "Cinnamon 3.8 – The Linux Mint Blog". blog.linuxmint.com. 2 May 2018. Retrieved 3 May 2018. ^ Lefebvre, Clement. "Releases · linuxmint/Cinnamon". Retrieved 4 May 2018. ^ a b Lefebvre, Clement (2 January 2012). "Introducing Cinnamon". The Linux Mint Blog. Archived from the original on 29 February 2012. ^ a b Lefebvre, Clement (23 January 2012). "Cinnamon 1.2 released". cinnamon.linuxmint.com. Archived from the original on 1 November 2012. ^ "Cinnamon 1.4 Released". The GNOME Project (Press release). San Jose, California. March 3, 1999. Retrieved June 8, 2014. ^ "cinnamon in Fedora repositories". fedoraproject.org. ^ "cinnamon in Debian repositories". debian.org. ^ "New features in Linux Mint 18 Cinnamon". Linux Mint. Retrieved 17 April 2017. ^ Stahie, Silviu (28 January 2016). "Linux Mint Is Getting Its Own Apps Starting with the 18.x Branch". Softpedia. Archived from the original on 27 April 2016. Retrieved 17 April 2017. ^ Nestor, Marius (3 February 2016). "Linux Mint Devs Showcase the First Two X-Apps for Linux Mint 18 "Sarah"". Softpedia. Archived from the original on 28 April 2016. Retrieved 17 April 2017. ^ "Cinnamon 1.4 (GNOME Shell Fork)". medvim.com. 13 March 2012. Archived from the original on 6 April 2016. ^ "User guides for Linux Mint, Cinnamon edition, many languages and versions". linuxmint.com. ^ Lefebvre, Clement (31 January 2012). "How to make a Cinnamon applet (Force Quit applet tutorial)". cinnamon.linuxmint.com. Archived from the original on 4 December 2012. ^ Lefebvre, Clement (28 January 2012). "New sections for themes, applets and extensions: Cinnamon". cinnamon.linuxmint.com. Archived from the original on 31 May 2012. ^ Lefebvre, Clement (16 May 2012). "Linux Mint 13 "Maya" RC released!". The Linux Mint Blog. Archived from the original on 6 September 2015. ^ Lefebvre, Clement (5 April 2012). "Update Pack 4 is out!". The Linux Mint Blog. Archived from the original on 24 May 2015. ^ Tsvetkov, Tsvetko. "Cinnamon Stable PPA". launchpad.net. ^ Andrew (5 December 2014). "New Cinnamon Stable Ubuntu PPAs [Ubuntu 14.04 And 12.04]". Web Upd8. Archived from the original on 20 September 2014. Retrieved 7 July 2017. ^ "Fedora 18 Features Updated User Interfaces and Desktop Environments". Red Hat. 15 January 2013. Archived from the original on 4 December 2014. ^ "Portal:Cinnamon". openSUSE.org. Retrieved 7 July 2017. ^ "Cinnamon". ArchWiki. Retrieved 7 July 2017. ^ "Mageia App Db Groups (Graphical desktop)". mageia.madb.org. ^ Noyes, Katherine (13 February 2012). "Sabayon Linux 8 Debuts with a Dash of Cinnamon". IT World Canada. Archived from the original on 16 July 2014. ^ "The FreeBSD GNOME Project". ^ Vaughan-Nichols, Steven J. (26 December 2011). "Linux Mint's Cinnamon: A GNOME 3.x shell fork". ZDNet. ^ Nestor, Marius (3 January 2012). "Introducing Cinnamon: The GNOME 3 Replacement". Softpedia. Archived from the original on 7 February 2012. ^ Gilbertson, Scott (24 June 2014). "Mint 17 is the perfect place for Linux-ers to wait out Ubuntu uncertainty". Ars Technica. Archived from the original on 29 August 2014. Retrieved 28 August 2014. ^ Vaughan-Nichols, Steven J. (27 July 2016). "Linux Mint 18: The best desktop -- period". ZDNet. Archived from the original on 27 September 2016. Retrieved 9 November 2016. Wikimedia Commons has media related to Cinnamon (desktop environment) and X-Apps. This page was last edited on 7 March 2019, at 05:50 (UTC).